One of the most common problems our London plumbers and drainage engineers are called out for is blocked kitchen sinks. Food waste is the main culprit for these nasty clogs, and if they’re not tackled correctly, they could lead to more serious drainage issues. However with our simple tips, you can learn how to unblock a sink without having to call in professional help. A blocked sink can come in more than one form. If your water is draining, but very slowly then you might not be too late to rectify this quickly and easily, before it becomes completely blocked. Pour 2 cups of baking soda down your sink, followed by 2 cups of white vinegar. When the two react you should see some fizzing, which with any luck will force whatever is blocking the sink out of the way. After waiting for the fizzing to stop, pour boiling water down the plug to dislodge the blockage. Keep flushing this out until the water flows freely. If this isn’t enough to unblock your sink, then you can try using a plunger to force air down the pipe and move the block. You can use the palm of your hand as a makeshift plunger by placing it over the plug hole to form a seal, and pushing down repeatedly. If your sink is completely blocked, with no water able to drain then you might have a bigger issue. However, still not impossible to fix on your own. The cause of most sink drainage problems is in the U-bend- the first bend in the pipe after the plughole. Before even considering the idea of removing this, make sure you are fully equipped with some rubber gloves, a washing up bowl and a towel. Lay the towel and washing up bowl directly under the U-bend, and using the rubber gloves to grip the pipe, begin to unscrew the pipe. Move slowly to ensure you aren’t covered with a flood of water and waste, and gently empty the contents into the washing up bowl. And remember whatever you do, do not use the taps while you are removing the U-bend. If you can’t dislodge the blockage manually, a wire coat hanger works well to get all the way through and loosen the block. Once you are confident the block is clear, wash the U-bend in warm soapy water. Bear in mind when reattaching the U-bend it should be fixed as tight as possible, but without cracking the thread. For extra security you might want to use some waterproof tape to ensure there are no leakages. If there is no blockage in your U-bend, the problem may be further in your drains. If this is the case then unfortunately this is where you will need to call in the experts. Our drainage engineers are fully trained to find the cause of the blockage and ensure it is cleared quickly and easily. Give us a call on 020 8879 9600 and we will aim to get someone out to you as soon as possible. 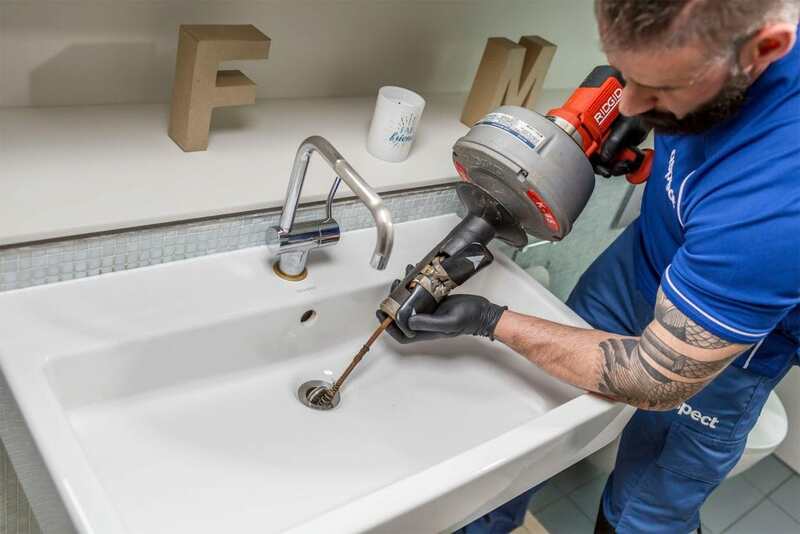 If you want to avoid having to deal with nasty blockages in your sink, as with most household issues, the best fix is prevention. Make sure everyone using the sink knows to dispose of food waste in a bin or composter, and avoid dropping any residue down your sink. A monthly clean with the baking soda and vinegar solution will ensure that there is no danger of food, oil and other waste blocking your sink, and causing you problems in the future! Previous: ​London plumber or gas engineer?